Is it a wrap? A donkey? No–it’s a superbaby…burrito! When I was new to California, Indian friends who had arrived before me told me eagerly about the exciting new cuisines they had sampled around the Bay Area. It became a bit of a parlor game to find the cuisine ‘most like Indian food’ — which meant, in practice, the most highly flavored with spices. People mentioned Thai food and Ethiopian food as contenders. One strong contender that kept coming up was the Mexican burrito. Of course, I was told about it from an Indian point of view. Imagine this, friends told me, rice and dal wrapped inside a roti! What could be better! The ‘dal’ in question was refried beans and the ‘roti’ was a tortilla. My friends were talking about the Mission Burrito (=’little donkey’), a fat wrap invented in San Francisco from Mexican ingredients, a cheap and healthful all-in-one meal. The Mission Burrito is meant to be customized. You stand at the counter while your food server moves through an assembly line with a tortilla laid flat in front of her. You can choose or decline each ingredient. Rice is in. You choose your meat, or none. You choose your beans. I quickly learned that I preferred black beans to refried or whole pinto beans. Shredded iceberg lettuce and cheese are usually turned down by me, but are a yes for most. Then, if you didn’t forget to use the keyword ‘super’ you get the big payoff. The supremacy of the super burrito lies in having all kinds of blandishments added to it — salsa, guacamole, sour cream, hot sauces, heaps of onion and cilantro. For a recent immigrant from India (me, then) — the word ‘super’ meant ‘chutneys’. Fantastic. 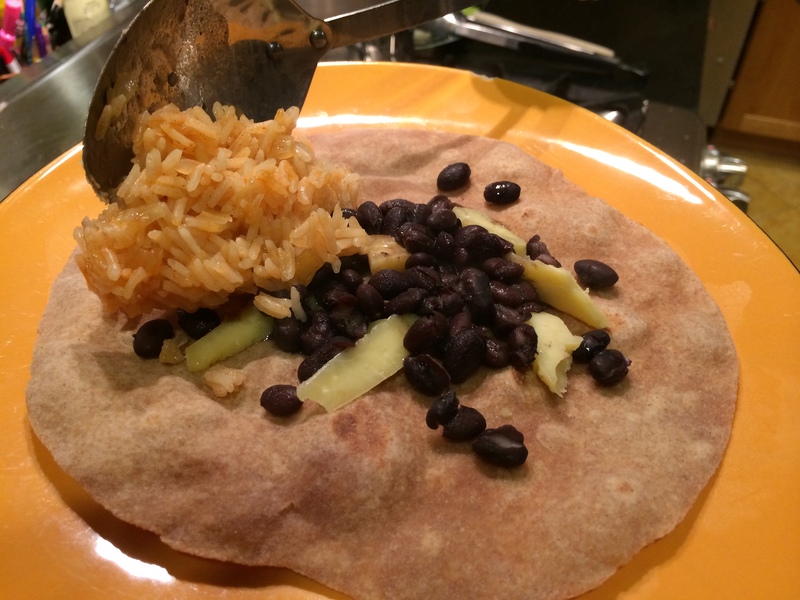 Then the tortilla is folded into a roll, tucked in at each end, and wrapped in double layers of foil. It can be eaten on the go, with no forks, plates, even napkins around. People know Silicon Valley for its technical innovations, but its burrito innovations are not far behind. Some places are famous for offering beef brain and beef tongue in the choice of meats. Some offer vegetables grilled on the spot. Many have adopted whole-wheat, spinach or tomato tortillas. One of my favorite taquerías offers cooked cactus (nopales) upon request. A ‘naked’ burrito is served in a bowl, without a tortilla wrapped around it. 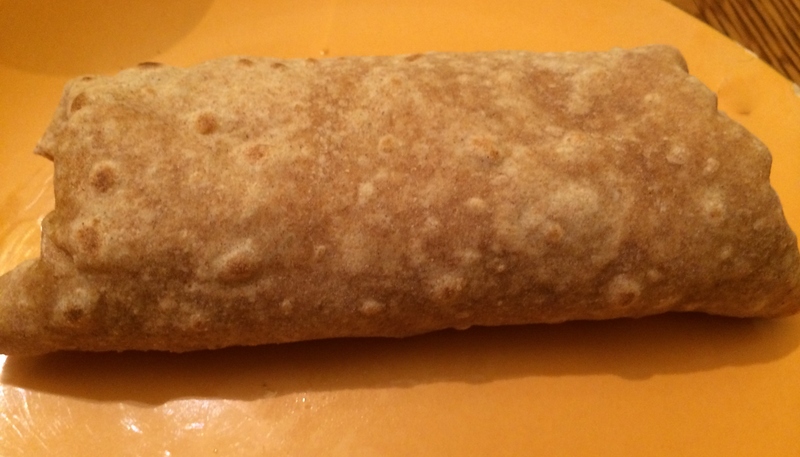 A ‘baby’ burrito is a smaller sized tortilla, suitable for lunch for a smaller-sized person. 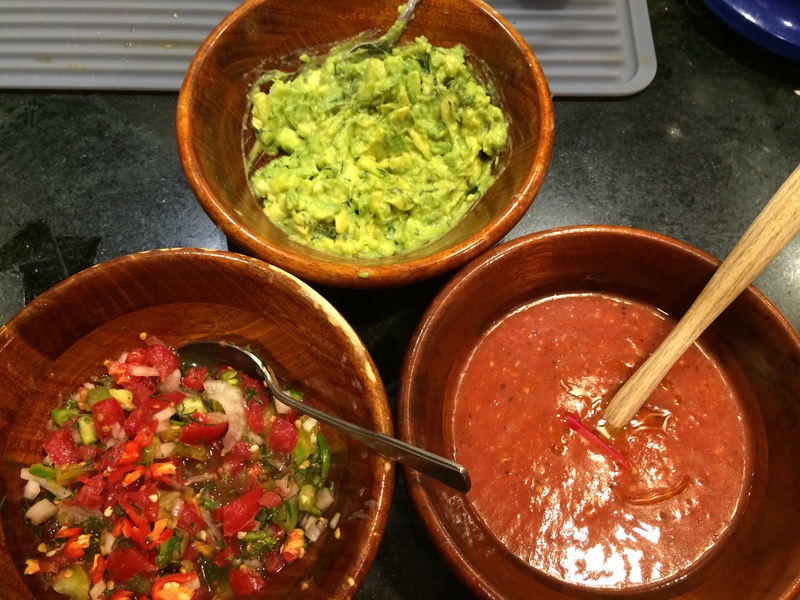 But here’s the other thing about the Bay Area…we must make this at home, from scratch! So here we go. For the tortilla I just made an Indian-style whole-wheat roti/chapati that added a nice wheaty complexity to each bite. They were smaller than the regular tortilla size, making this a ‘baby’ burrito. I bought dry black beans and soaked them overnight, then pressure-cooked them for 15 minutes to have the most luscious, earthy, non-metallic tasting black beans ever. 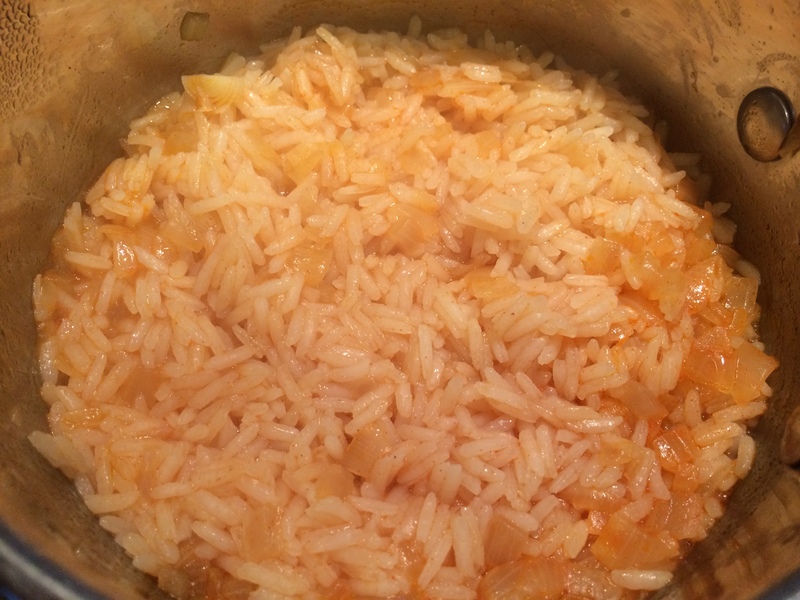 The rice was cooked using the liquid drained from the tomatoes. 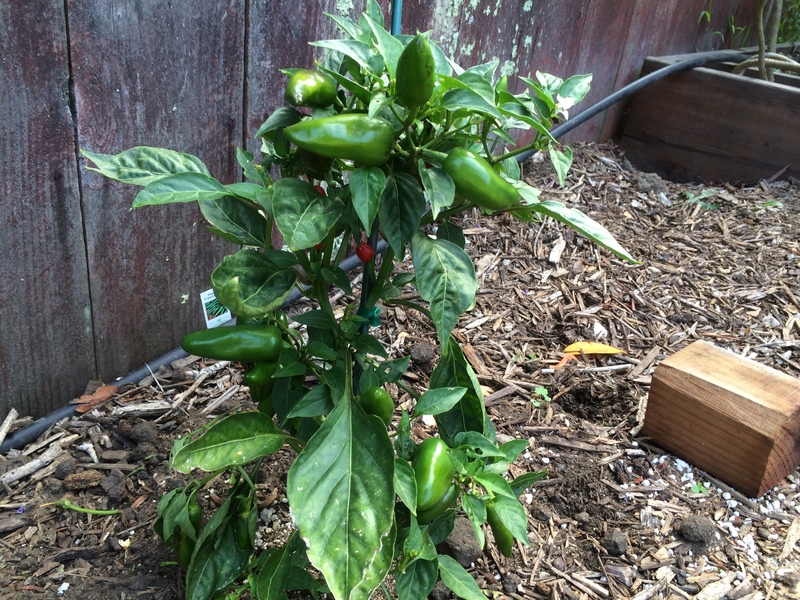 The hot sauce came from this recipe for Mexican hot sauce. 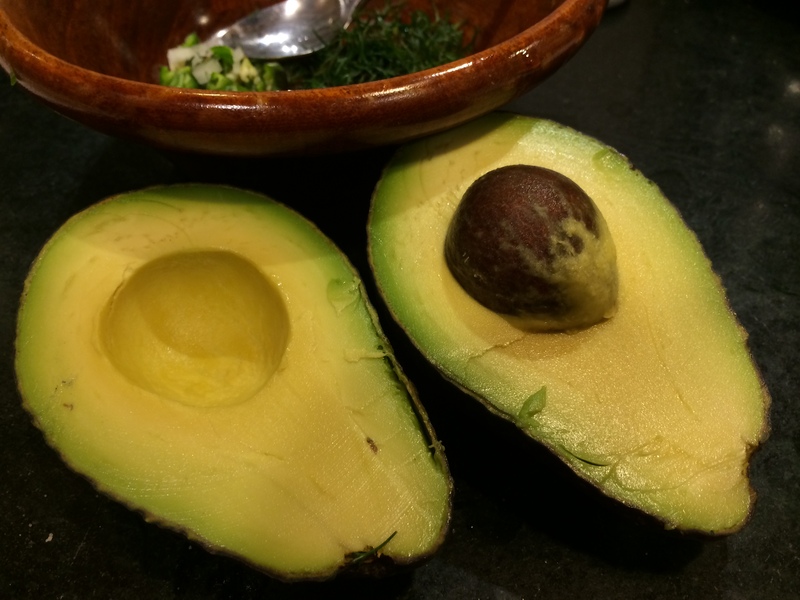 For the guacamole I used a nice large Californian Hass avocado. 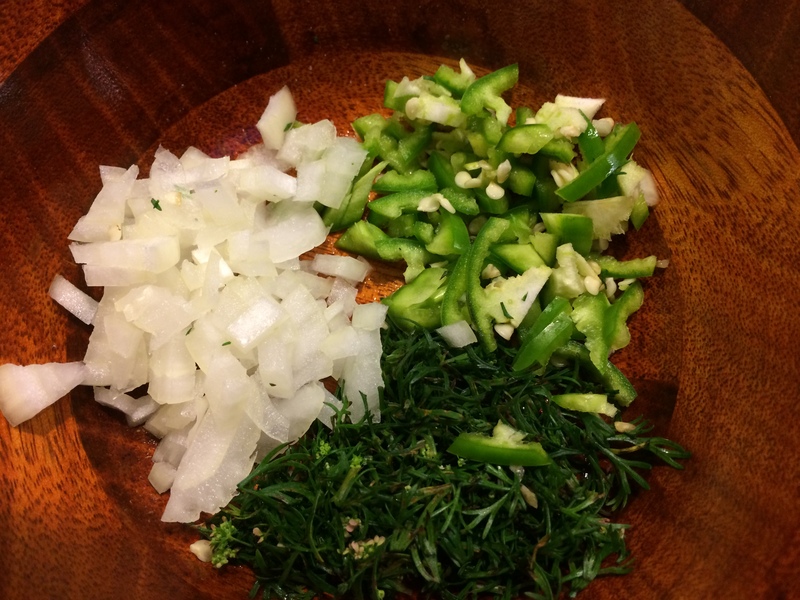 Cilantro and Fresno chilies from my garden. 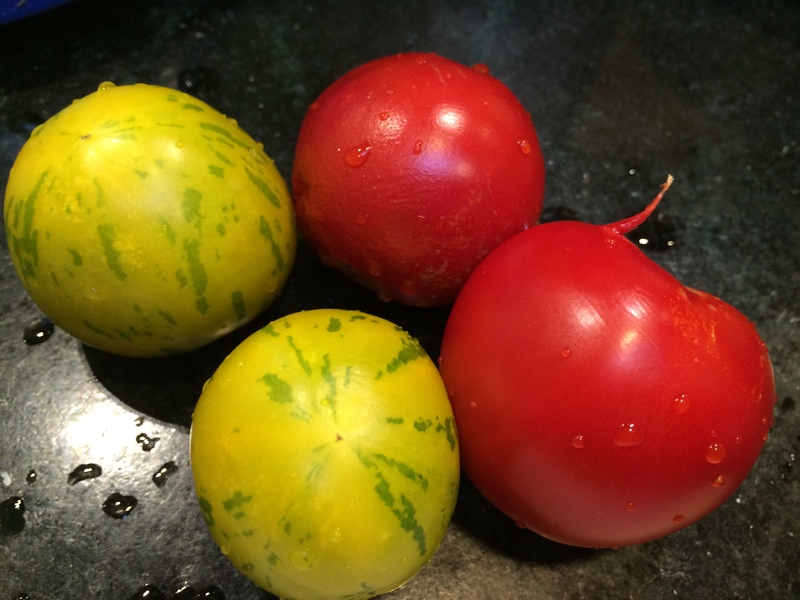 A mix of green zebra and early-girl tomatoes for the salsa. I made it vegan but my husband added some cheddar cheese. You could add sour cream or thick homemade yogurt, whisked. Yes, it certainly had some Indian flavors…. 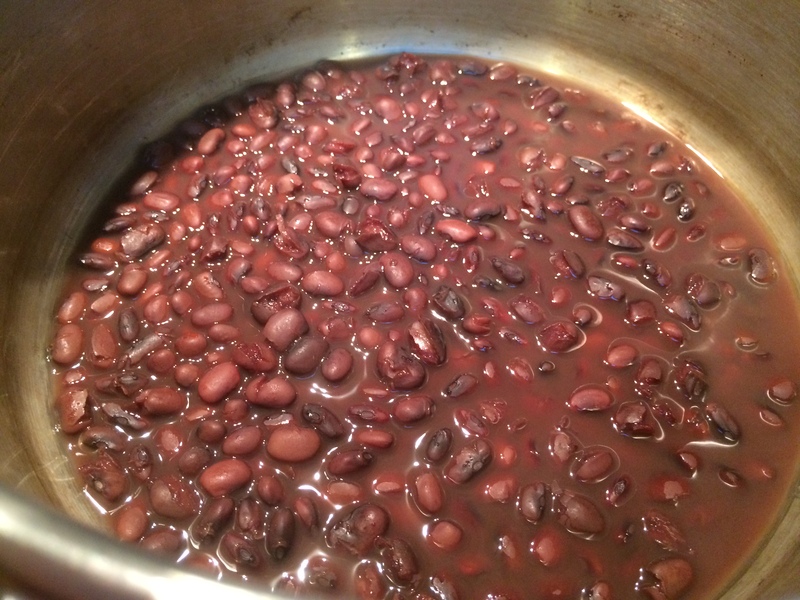 Soak the black beans over night or for about 6 hours. If you are short on time, soak them in near-boiling water for an hour. Drain and pressure-cook for 15 minutes with 1/2 cup water. Add the salt after it is done cooking. 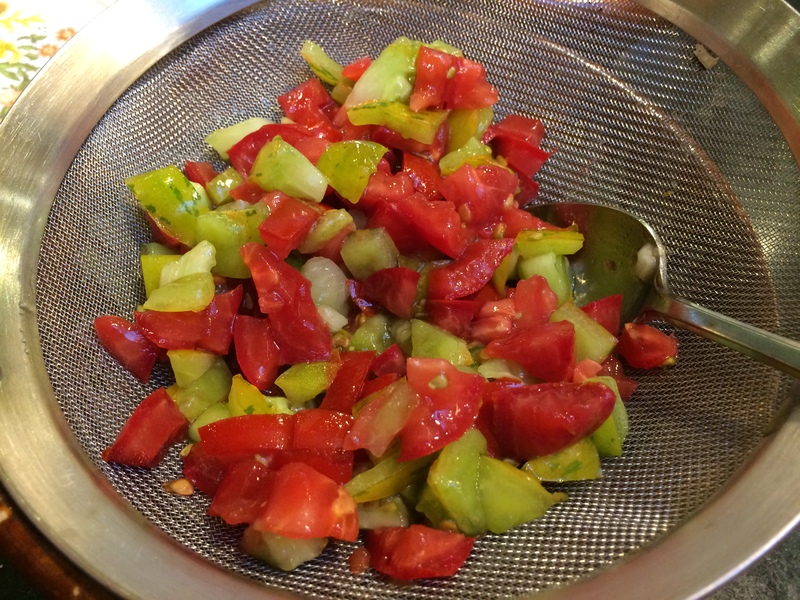 Dice the tomatoes and place them in a strainer with some salt mixed in, and allow to drain for half an hour or so. 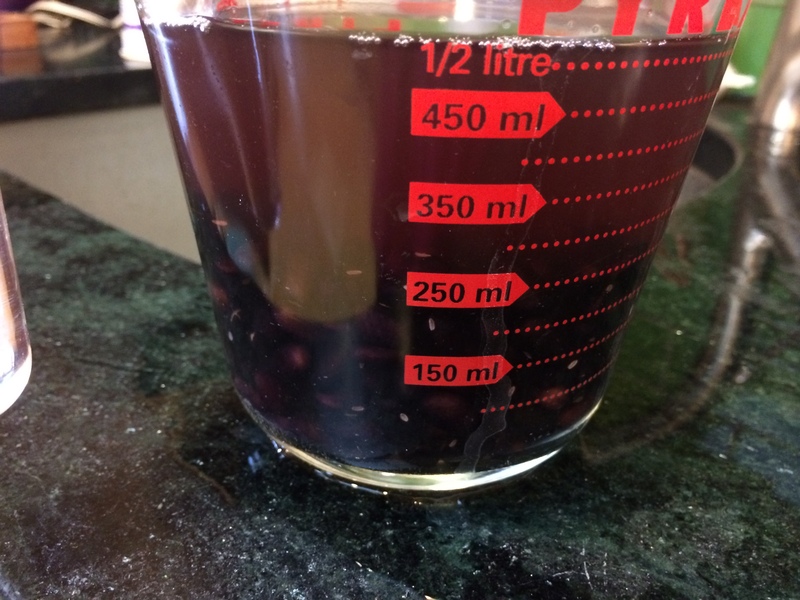 Collect the drained liquid in a bowl, this will be used later for the rice to add a subtle tomato-ness. 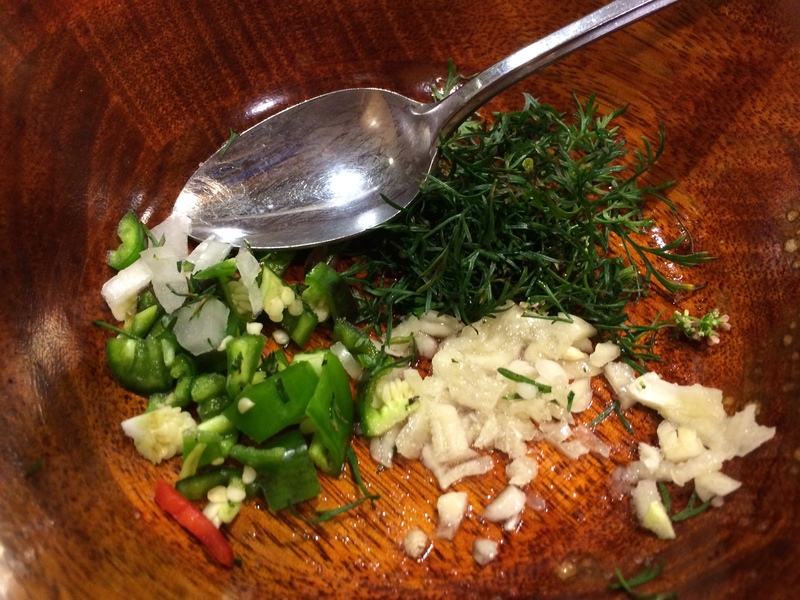 Meanwhile finely chopped the onion, chili and cilantro. Once the tomatoes seem to be done draining liquid, mix it in with the onion, chili and cilantro. Add lime juice, mix, taste, and adjust for salt. 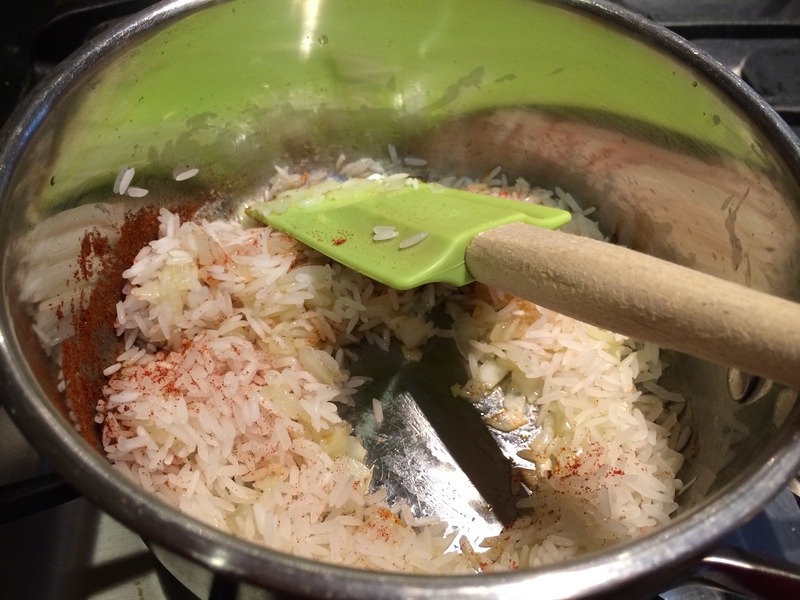 Finely mince the garlic, add some salt to it and leave it mixed with salt for about 10 minutes. In this much time it will have turned pasty and ‘cooked’ a little. 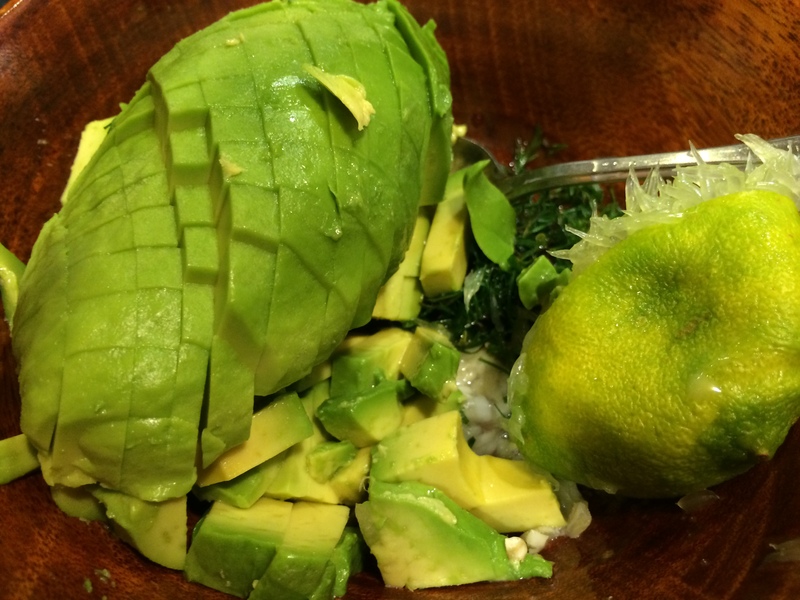 Cube the avocado flesh, mix it all together with lime juice. You can mash the avocado if you like but I like to leave little chunks. Heat the oil in a thick-bottomed pot. When it shimmers put in the minced onion, the cumin and paprika. Let them cook a few minutes on medium heat. Now in goes the rice. Stir to coat with oil. Next put in the water (including tomato liquid) and salt. Cover, bring to a boil, then simmer for 7 minutes. Turn off the flame and let it rest, covered, for a few minutes before opening the lid. I’ve left the amounts vague because you can customize each the way you want to. Layer the ingredients onto the roti laid out flat. Don’t overstuff it if you want a nice roll that you can bind securely. 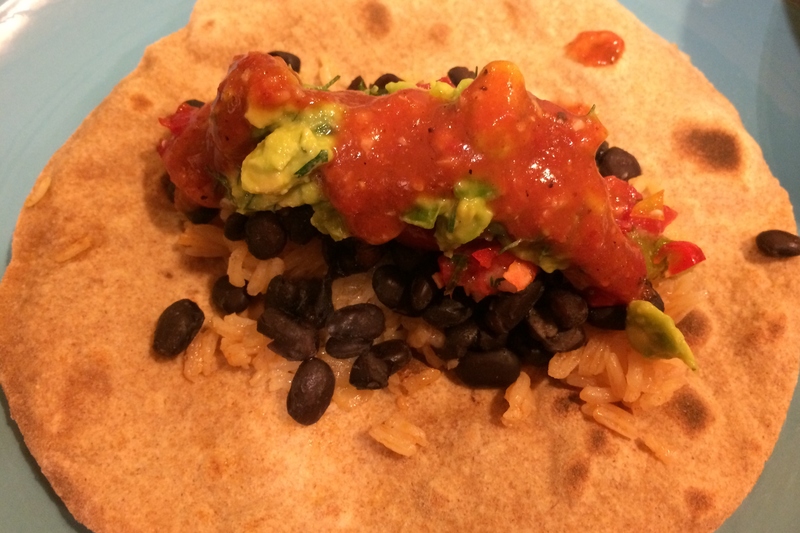 Fold in the two lateral edges to hold the fillings in place, then roll up the entire burrito starting at the bottom. Enjoy. Found the Vegan Potluck folks who host a wonderful weekly vegan bash! That’s almost poetic. Entering this recipe there. I love food that can be customized. It might not be authentic, but it is a whole lot of fun. Even better is just piling all the ingredients on the dining table and everyone just assembles their meal to taste. I love a lot of cilantro while my husband hates it so compiling our own is always better. Agree. 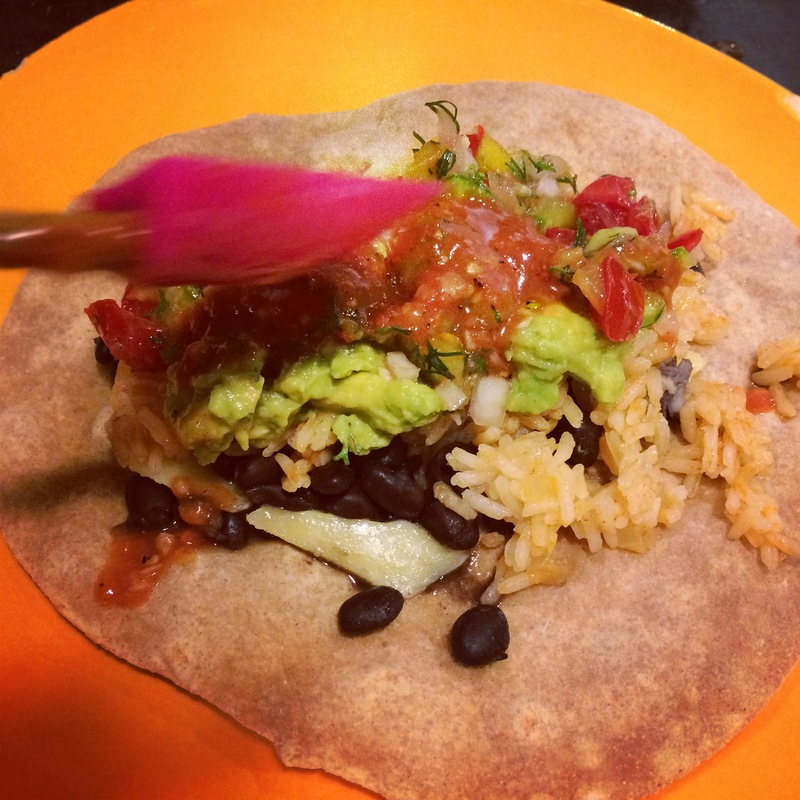 There are few foods that lend themselves to customizing…burritos are one of them. Too bad your husband is a cilantro hater. My hubby used to be also. Now he has found several preparations where he likes it. Our rabbit loves cilantro and if my husband picks up our rabbit after he has been indulging in cilantro, the bunny breath makes my husband nauseous! I just chop up cilantro and sprinkle it on my plate after cooking. No biggie. My kinda food! Love all that you threw in. More possibilities too…sky is the limit. Would love to see your take on this Namrata! Burritos are pretty much the best food ever. Thank you so much for sharing this with us at the weekly Potluck! Thank you for hosting, such a great idea. Super indeed! This burrito has definitely got it going on. I love how infinitely customizable it is, and jam-packed full of flavorful fillings.